Best Buy gets exclusive dibs on Fire TV sets and becomes a third-party Amazon seller. Best Buy has partnered with Amazon to sell voice-controlled Fire TV Edition branded TVs in its stores and on its website, the companies announced. CEOs Jeff Bezos from Amazon and Best Buy's Hubert Joly said the retailer will sell 11 Amazon-powered TVs, including 4K and HD models, starting this summer with Toshiba models. At the same time, Best Buy will become a merchant on Amazon's website and get exclusive rights to sell Amazon Fire TVs. "Amazon and Best Buy have a long history of working together," said Bezos, referring to Best Buy sales of Kindle readers. "Today we take our partnership to a new level." Amazon unveiled its first Fire TV Edition sets last year with TV maker Element, starting at $449 for a 43-inch model. 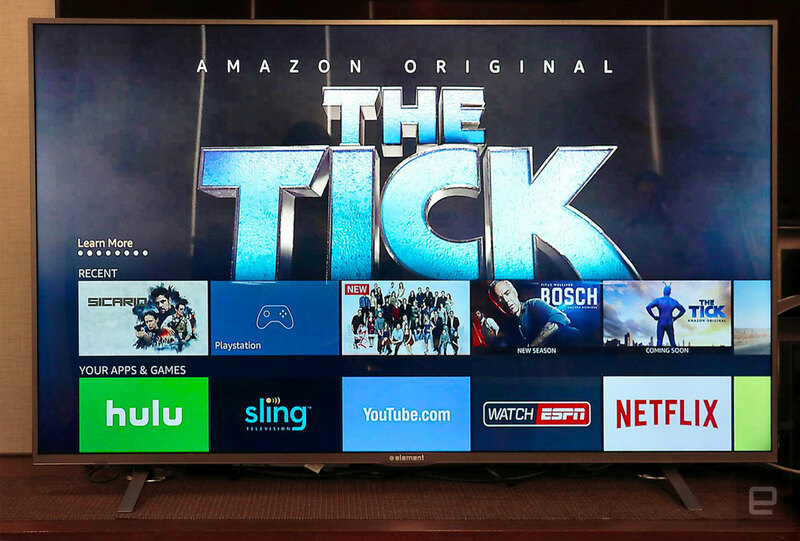 The TVs expand on what you can do with a Fire TV stick, letting you see live TV alongside streaming options, detect devices connected to your TV, and consult a channel guide, to name a few features. At the same time, you can use Alexa to control not just your TV, but also Hue lights and other smart home devices. Unlike with an Echo device, you have to hit a button to reach Alexa, as it's not listening for a wake word. At first glance, the partnership seems one-sided in favor of Amazon, but it appears to be a good deal for Best Buy, too. The retailer now has exclusive access to Fire TV Edition TVs, both at its stores and as a newly-minted Amazon third-party reseller. Best Buy will sell third-party brands along with its own house-brand Insignia Fire TV Edition smart TVs, both physically, on its own website and at Amazon. Amazon will benefit, of course, by having its sets in physical stores. Customers might be more apt to grasp the benefits of an Alexa-powered set if they can try one out. At the same time, if you're convinced, running to Amazon for a cheaper price will take you straight back to Best Buy. "What we're doing is so deeply integrated," Bezos told the WSJ. "It's only possible because we trust each other." Under Joly, Best Buy has made a fairly miraculous recovery from its moribund state in 2012. It remains to be seen if both parties will benefit from the partnership, though, and Amazon has only just started selling the Fire TV Edition sets, so their popularity is not assured (see: the Fire Phone). We'll soon find out, though, as the first Fire TV Edition smart TVs from Toshiba will go on sale this summer at Best Buy stores, BestBuy.com and on Best Buy's upcoming third-party seller site on Amazon.com. Future models and manufacturers will arrive later on in 2018.